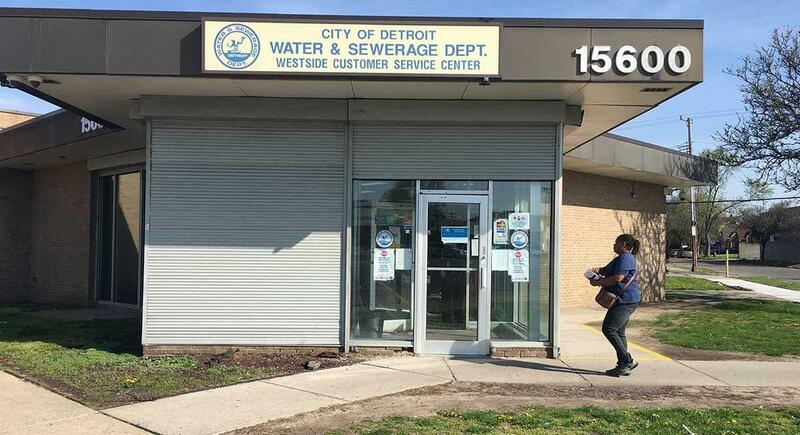 A customer walks into a Detroit Water Department customer service center on the city’s west side. Detroit’s aggressive shut-off policy has shut the tap on more than 100,000 homes since 2014, a strategy decried by civil rights groups. It’s an astounding number. But in a city like Detroit, wracked with poverty and just three years removed from bankruptcy, it’s also a sign of progress. Shutoffs by ZIP code: Detroit has disconnected water to more than 17,600 homes this year. That’s down from last year, but still means that 10 percent of the city’s 175,000 residential customers had service interruptions. Use this map to explore disconnections by ZIP code and how they relate to poverty and home ownership rates. Note: The city doesn’t shut service at apartment complexes, and housing units in Hamtramck and Highland Park were removed from ZIP codes that overlap with Detroit. 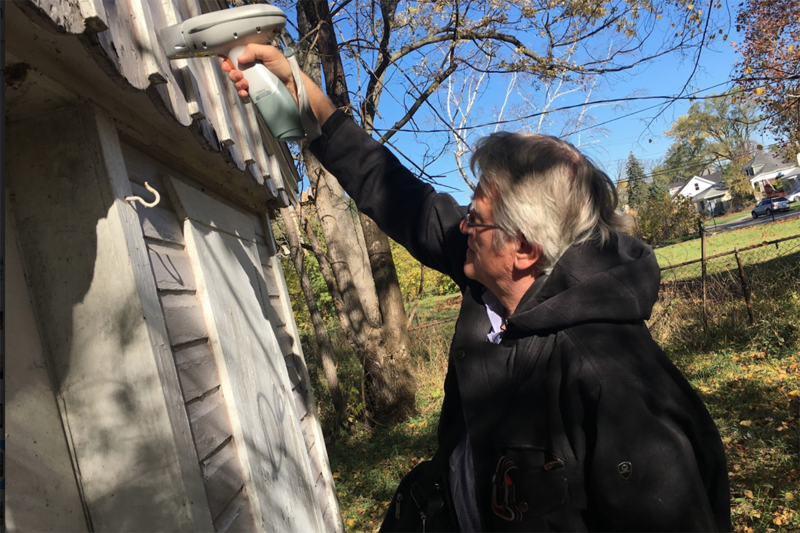 Since the city launched an aggressive campaign in 2014 to shut taps over nonpayment, nearly as many homes have been disconnected in Detroit (101,000) as there are houses in all of Ingham County (111,000), according to city records obtained by Bridge Magazine through the Freedom of Information Act and the U.S. Census. Through October, Detroit has disconnected 17,689 of its 175,000 residential accounts in 2017. That’s a 26 percent decline from the first 10 months of 2016, and puts the city on track for about 20,000 disconnections this year – the fewest since the campaign began. City officials say the decline is proof the shutoffs – as well as assistance programs – are reversing a longstanding culture of nonpayment that plagued the city and edged it toward insolvency. 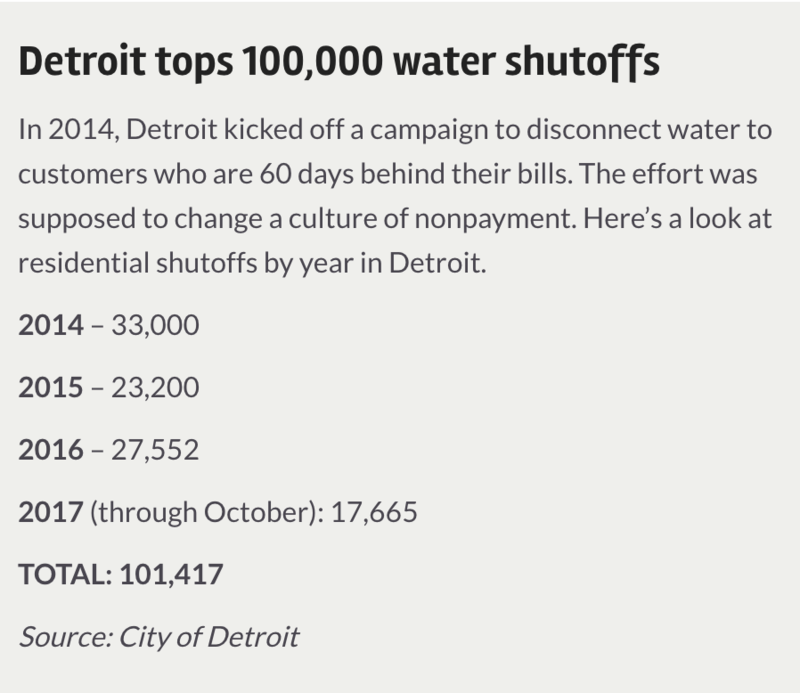 When Detroit went bankrupt in 2013, one-third of all its debts were from the water department, about $6 billion. “We are doing what we said we’d do,” said Gary Brown, the city’s director of water and sewerage. Detroit disconnects homes that are at least $150 and 60 days overdue. Taps are reconnected once residents pay a portion of the delinquency (10 percent for first offenses, up to 50 percent for subsequent ones). In most cases, that’s in a few days, but can extend for weeks and even months. Furor over the shutoffs has faded since they drew condemnation from United Nations experts in 2014, who called them “contrary to human rights.” But activists continue to study the health effects of the campaign, which they said are significant. No one should cheer the decline, said Emily Kutil, an architecture professor at the University of Detroit-Mercy. “It’s still 18,000 homes. It’s still horrifying,” said Kutil, who studies shutoffs for the We the People of Detroit Research Collective, a Detroit-based group that involves academics nationwide. The decrease coincides with a plunge in the number of tax foreclosures – another big, negative metric used as a barometer for neighborhood health in Detroit. Tax foreclosures dropped to 6,315 properties in Detroit this year, down 75 percent from 24,973 two years ago. “These are good signs,” said Detroit City Councilman Scott Benson. The water shutoff records obtained by Bridge don’t show how much individual accounts owed or whether they were subjected to multiple shutoffs. But the records show shutoffs are a fact of life throughout the city, especially in densely populated neighborhoods on Detroit’s northwest side. Along Ashton Avenue that runs parallel to Southfield Freeway, for instance, 123 homes were disconnected, including 53 over three days in May. The areas least hit by shutoffs: Downtown and Midtown. That’s largely because those neighborhoods have so many apartment complexes, which the city doesn’t disconnect. But the city’s wealthiest neighborhoods, such as Woodward and Seven Mile and Indian Village, also had the some of the lowest shutoff rates. “This is a poverty issue,” Brown said. There’s not always a direct link between shutoffs and poverty, though. Take the Warrendale and Morningside neighborhoods. More than 45 percent of residents in both neighborhoods are poor. But Warrendale, on the southwest side near the Dearborn border, had a shutoff rate of 108 shutoffs per 1,000 occupied homes. In Morningside, on the northeast side, the rate was 63 of 1,000 occupied homes, according to city records and U.S. Census data. The data also show that residents, not businesses, continue to bear the brunt of the shutoffs. This year, the city has disconnected 1,122 commercial and industrial properties. That’s triple the number of non-residential shutoffs from a few years ago but still a fraction of the overall shutoffs. Brown said Detroit has dramatically decreased residential shutoffs in part by putting more than 19,000 residents on payment plans and thousands of others in an assistant program for lower-income residents that pays for up to $1,000 in debts. A Water Department payment center on the city’s west side saw steady foot traffic on Monday. Some grumbled about the price of bills — about $75 per month — but many said the city’s message to pay up or get shut off has sunk in. “I don’t understand the people who don’t pay their bills. I pay mine. You need that water, lights and gas,” said resident Ronell Owens. But activist DeMeeko Williams said the “true extent” of the campaign is underestimated because those who can’t pay their bills are ashamed and afraid to speak up. 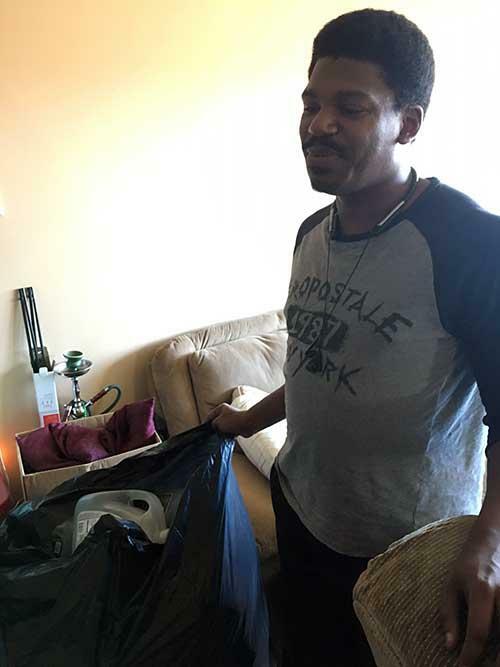 Detroit resident Meeko Williams inspects plastic jugs he’ll fill with water and bring to those whose service has been disconnected. Williams, who is director of the Detroit Water Brigade, says the three-year shutoff campaign has “paralyzed” parts of Detroit. We the People of Detroit Research Collective is set to publish two papers early next year that conclude the impact is far greater than the city has stated, said Nadia Gaber, a University of California-Berkeley medical anthropology doctoral student involved in the research. The studies found shutoffs disproportionately affect the city’s most vulnerable residents, such as seniors and those with disabilities, and last 10 days on average, rather than the 24 hours the city has touted, Gaber argued. The research is modeled on U.S. Centers for Disease Control studies following natural disasters, she said. “To take away something as basic and fundamental as water, it’s absolutely a disaster,” Gaber told Bridge. Far less clear: The effect – if any – on public health because of the shutoffs. Two politicians, state Sen. Coleman A. Young II (who lost a bid for Detroit mayor in November) and Democratic governor candidate Abdul El-Sayed (the city’s former health director) have argued the shutoffs have created a public health crisis. This year, a study by the We the People group and researchers at Henry Ford Global Health Initiative found an association between shutoffs and some water-borne illnesses. Using shut-off data and admissions at Henry Ford Hospital in Detroit, the study found that patients who lived on a block with shutoffs were 1.55 times more likely to have a water-associated illness, even when other socioeconomic situations are taken into consideration. The study, though, only found a general correlation – not a causation – and water activists were criticized by Henry Ford and one of the study’s own authors, who said the issue needs more study and was being politicized. Since then, activists and even some Detroit union leaders have questioned whether a Hepatitis A outbreak in southeast Michigan is related at all to the shutoffs. Public health officials discounted the possibility when Young asked the state this spring to investigate whether there is a link. Hepatitis A is spread by food or water or from feces or bodily fluids of infected people. Kutil said the fear is that those without running water may go without hand washing or showering, increasing the possibility of spreading the contagious liver disease. Brown, the city’s water director, said “there is no evidence of the source of Hepatitis A or any other illness is our water.” He noted that continuous tests show that it is among the safest in North America and well below federal requirements for lead levels. WRAP Program: Offers up to $1,000 per household per year, home energy audits, housing repairs and other programs. Help also is available to suburban residents. It is limited to low-income families. More information here or (313) 386-9727. 10/30/50 Plan: Delinquent Detroit customers can get water service reconnected if they pay 10 percent of their bill. If they are shut off again, a 30 percent down payment is required. For subsequent shutoffs, residents must pay 50 percent of the bill to get service restored. More information here or (313) 267-8000. Relief groups: Nonprofits deliver bottled water to those without service and/or help with deposits to reconnect service. More information at detroitwaterbrigade.org, wethepeopleofdetroit.com and detroitwaterproject.org. Bridge Magazine reporter Mike Wilkinson contributed to this report. Stateside's conversation with reporter Joel Kurth. Lead levels among Detroit children are rising after decades of decline, and health officials say the city’s aggressive housing demolition program is partially to blame. The city has razed nearly 13,000 homes since Mike Duggan was elected mayor in 2013. Detroit might be one of the largest socio-economic laboratories in the world. Billionaires are rehabbing iconic downtown buildings. The federal government is funding demolition of tens of thousands of abandoned houses. And private foundations are testing out all kinds of projects to see what might spark neighborhood revival. Many Detroit neighborhoods need help. A lot of blocks are little more than a couple of occupied homes, a few abandoned houses, some burned out structures, and overgrown vacant lots. Between 1970 and 2010 Detroit lost more than 228 thousand occupied housing units according to a recent report by the Urban Institute. Update: 5/24/2017 The business, Hammer Time True Value Hardware, closed shortly after the interview with owner Bill Kamman. That leaves another substantial gap in the business district on E. Warren Avenue in the MorningSide neighborhood. There are small business districts throughout Detroit that are barely hanging on. They were once thriving. But population loss and the loss of wealth in the neighborhoods have created hard times for neighborhood businesses. The question is: what to do with them now?